Philadelphia Transit Workers Go On Strike, Shutting Down Buses, Trolleys : The Two-Way Around 4,700 transportation workers went on strike at midnight after their contract expired and negotiations failed. Affected buses, subways and trolleys usually handle more than 800,000 trips a day. 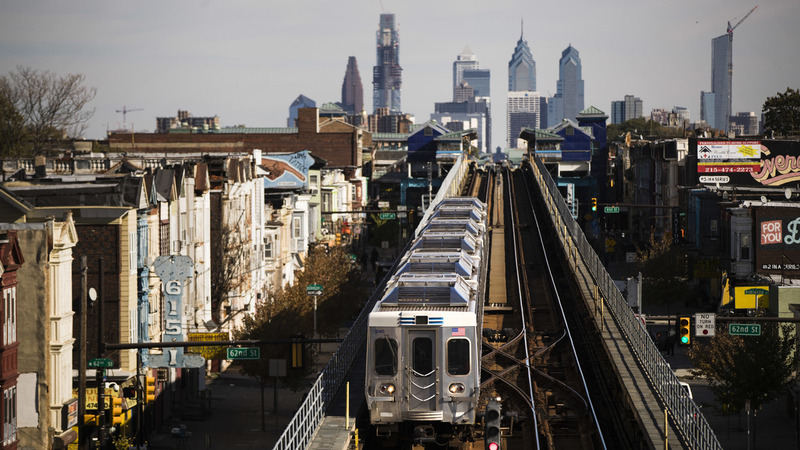 A train moves along the Market-Frankford Line in Philadelphia on Wednesday. Transit workers went on strike early Tuesday, shutting down bus, trolley and subways that provide about 900,000 rides a day. Around 4,700 public transportation workers in Philadelphia went on strike at midnight, shutting down many of the city's transit options. The members of the Transport Workers Union Local 234 and the Southeastern Pennsylvania Transportation Authority, or SEPTA, were unable to agree on a new contract. The strike is causing widespread disruption, and raising concerns that if the situation is not resolved it may interfere with Election Day next week. "All Philadelphians—not just regular SEPTA riders—should prepare for significant disruptions to their commutes, especially the evening rush hour," member station WHYY reports. "The strike shut down all of SEPTA's city transit services: Buses, trolleys, trackless trolleys and subways that operate in the city, which usually handle 884,000 trips a day, will not run." Regional rail is the only service still operating, SEPTA says — and even before the strike, rail services were operating "at near capacity." WHYY reporter Tom MacDonald spoke with NPR from a suburban rain station in downtown Philadelphia, where he said the trains that were running were struggling with large quantities of riders — many of them unfamiliar with the trains. "We've got delays as much as 99 minutes on some of these rail lines," MacDonald said. "Everything is behind ... the riders are frustrated. I mean, they want their regular way of going to work." MacDonald notes that the union had been warning Philadelphia residents for weeks that a strike was in the works. But many residents are used to deadlines being extended in situations like these — a few days' delay as the union and SEPTA try to work out a deal. "The union went on strike at exactly the strike deadline and that's caught some people off guard," MacDonald says. It's also left students in the lurch. NBC Philadelphia, citing school officials, said around 60,000 students public, private and charter school students rely on public transit to get to school. Schools in Philadelphia are remaining open on Tuesday, The Associated Press reports. "[School officials] are saying that those who don't make it in will be given an excused absence, but parents are urged to find a way to bring their children to school or get them there, one way or the other," MacDonald reports. The strike was initiated after negotiations broke down over issues including health care costs, pensions and worker rest, WHYY has reported. SEPTA says the union walked away from "pay raises, enhanced pension benefits, maintained health care coverage levels and continued job security." The union says SEPTA's representatives "refused to address non-economic issues affecting operator and public safety." If the strike lasts a week or more, SEPTA plans to file an emergency temporary restraining order to suspend the strike for Election Day next Tuesday, to ensure that all voters will be able to access the polls, WHYY reports. In 2009, a SEPTA strike lasted for six days.